I decided to check out the web series Just Us Guys last week and found that I’ve really enjoyed it. It’s constructed as a direct address vlog — we all know those and probably subscribe to several — and while it may be lacking in blocking, it’s definitely worth a watch. 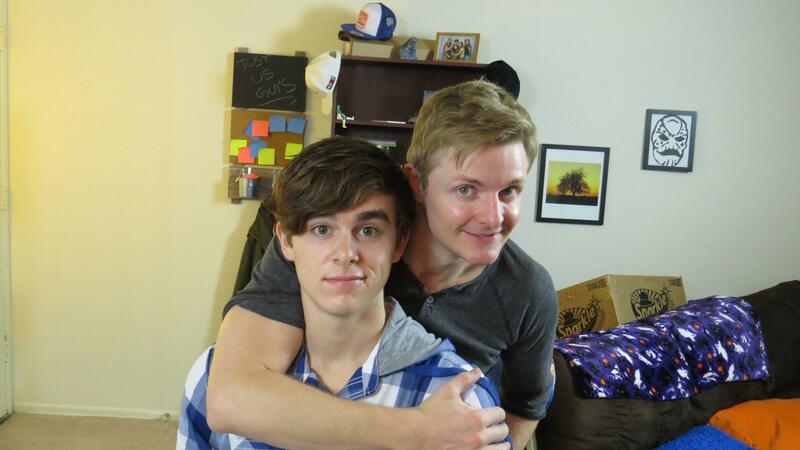 Skyler Seymour as Max Sherman and Scott Hislop as his dad, Scott Young in the meta vlog series, Just Us Guys. |Image fr. Snobby Robot. The conceit is that a single-parent gay dad and his straight son decide to begin vlogging together as a bonding experience. Along the way you learn that the son is generally the more mature one, the grandma is a bigot trying to redeem herself, both the father and son start dating, and along the way, you find yourself beginning to form a real connection with these characters, who are not presented as characters but as real people on a real vlog. It’s a clever leitmotif, I have to acknowledge, but I think its the likability of the leads that makes one come back again and again to these short, well, vlog-size, bites. Scott Hislop is the father, Scott, and Skyler Seymour is the son, Max. They’re effortless performers who have great chemistry and the relationship is completely believable. It’s a bit more forced when other characters are introduced and the two-hander set-up is thrown out, but I am glad to see inclusion of all sorts, including Max’s deaf girlfriend, Beth, played by Amanda McDonough. Both Seymour and McDonough sign as well as speak through their scenes, again quite effortlessly. Chris Lilly has come up with nearly 40 episodes as of this writing and they are currently on a riff about bullying. I hope they continue; it’s a show that’s educating and entertaining. Good on you, sir. Here’s an embed of Episode One. You can subscribe on YouTube. P.S. to my Days of our Lives groupies: Tammy Taylor, who plays Scott’s mother on Just Us Guys, played Hope Williams prior to Kristian Alfonso taking the character into the soap stratosphere as one-half of one of Days‘ most popular supercouples of all time. Ya learn something new every day!